Can Sharjeel Khan make an impact in Tests? Sharjeel Khan's inclusion in Pakistan's test squad for the two match series against New Zealand has met with mixed reactions. Rightly so given the sort of batsman he is. My initial thoughts on Sharjeel were that at best he is a T20 batsman. His initial international outing in 2013 also showed that he was best suited for T20s, however he was dropped from both limited overs formats after failing in ODIs. Following the PSL last year, Sharjeel was drafted back into the T20 and ODI squads. In T20s he continued his striking form, while in ODIs he left plenty to be desired with a number of failures in between some sterling whirlwind knocks. For me, he remains a great T20 batsman and an average ODI one. So then why has he been selected for the test squad? What were the selectors thinking? Is he the best choice for opener / reserve opener in the test squad? Sometimes it just feels like the selectors are making a play at a Casino and trying their luck at winning with a new opener. With Sami Aslam cementing one of the openers slots, it was Azhar Ali's initial hesitancy to open in tests, which resulted in the selectors looking for a third opener for the tour. Having given it some thought, Sharjeel may not be a bad choice despite his average performances in ODI cricket. Many have likened Sharjeel's stroke play to that of Virender Sehwag and David Warner, both of whom played ODI cricket for a couple of years before breaking into the test squad. All three are quite similar in terms of how they approach batting. A glance at Sehwag's and Warner's careers shows that they had / have far better performances in Tests than in ODIs. While Warner has closed the average gap in recent times (48 in tests; 41 in ODIs), Sehwag ended his career with a Test average of 49 and an ODI average of 35. Even thought both batsmen have the aggressive nature to excel in ODIs and T20s, they were far more prolific in Tests than in the limited overs formats. A look at their ODI performance before either made their test debut bears a lot of similarity with Sharjeel's performance. 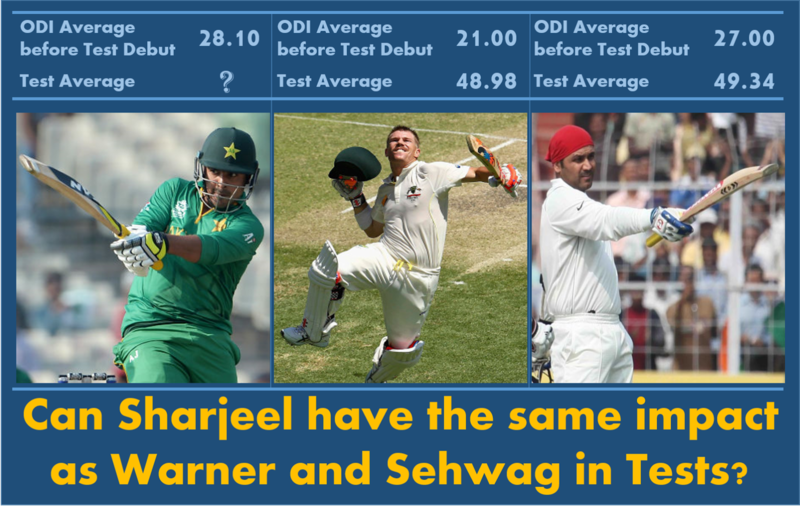 In fact, Sharjeel has fared better than Warner and Sehwag did in their initial years of ODI cricket. This also goes to show that both Warner and Sehwag improved as ODI players after making their test debut. Probably it was learning the art of staying at the wicket longer in Tests that made them better ODI batsmen. Maybe, Sharjeel will go through the same learning curve if he does in fact make it to the Test XI in New Zealand. Given that he is a batsmen made in the same mold as Warner and Sehwag, his inclusion in the Test team might end up being a master stroke by the selectors. He may end up being the perfect aggressor to complement Sami Aslam's gradual accumulation at the other end. He may provide that spark to Pakistan's Test team whose top 6 batsmen bat in the same mode. If Sharjeel can have even half the impact that Warner and Sehwag had on their Test teams, it would be a job well done for Pakistan. While I don't rate him much as an ODI batsman, I am actually looking forward to the prospect of having an attacking batsman at the top of the order in Tests.